With the 116th United States Congress sworn in just over a month ago, it is a crucial time for us to be thinking about how we as advocates can align ourselves with our Congressmen and Congresswomen to fight for the quality, inclusive, free education for all that GCE-US is so passionate about. YOU Can Help Youth Attend the Global Campaign for Education Youth Caucus & World Assembly Today! "In January 2015, the World Assembly of the Global Campaign for Education formally recognised the need to represent and include youth-led movements more formally in its structure. Many of our members already work in partnership with youth-led organisations, and it was time to give them the place they deserve in the global education civil society movement. This year, the GCE goes one step further by hosting a Youth Caucus during our World Assembly in November. GCE-US holds a Youth Advocacy Summit which gives youth advocates a platform to speak to their representatives to advocate for global education on Capitol Hill. The summit includes a training day with panelists from various coalition members within the Global Campaign for Education and a day of scheduled congressional meetings where the Youth Advocates can directly speak to their representatives about why access to quality education around the world matters to them. Read about my experience here. As a parent of two active children, I see the amazing skills and knowledge they’re gaining at school every day. Yet the vital right to education is just a dream for 75 million children impacted by emergencies and crises. Across our global community, we cannot wait any longer and must act today to reach all children with quality education. 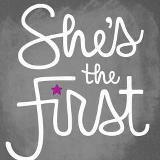 She's the First sponsors girls' education in the developing world with the goal of creating first-generation graduates and our next generation of global leaders.